The Western Cape Provincial Parliament’s Standing Committee on Economic Opportunities, Tourism and Agriculture will conduct a series of public hearings focusing on the Communal Property Associations Amendment Bill [B 12B–2017] (NCOP). 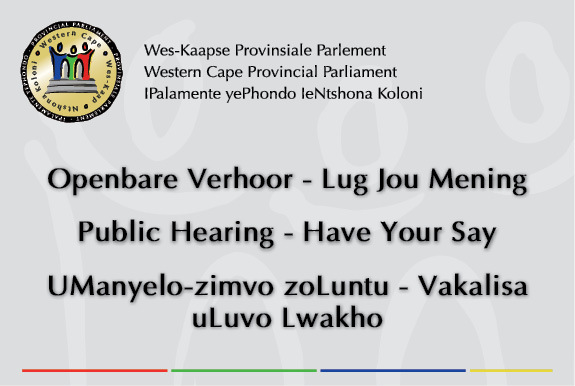 These public hearings will be conducted in accordance with the national Constitution and the Constitution of the Western Cape. Written submissions and requests to make verbal presentations on such submissions must be directed to the Standing Committee’s Coordinator, Ms Zaheedah Adams (tel 021 487 1641 or email zadams@wcpp.gov.za). Requests to make verbal presentations at the public hearings must be submitted to the Committee Coordinator at least one day before the scheduled public hearing. Written submissions must be received by Tuesday, 13 November 2018. Copies of the Communal Property Associations Amendment Bill [B 12B–2017] (NCOP) are available here.